DSC_0027.JPG, originally uploaded by hep. oh my god lj why is my heater breaking ON THE EVE OF THE COLDEST DAY IN OVER 30 YR. swear to fkn god. luckily we have like 100 electric space heaters, but srsly not what i needed right now. i have to finish all my work today so i can take tmrw off if it DOES snow, and i need to do all my normal thursday stuff too. plus bed down all the animals for temps lower than they are used to. so here is another pic i took in golden gate park a week or so ago. 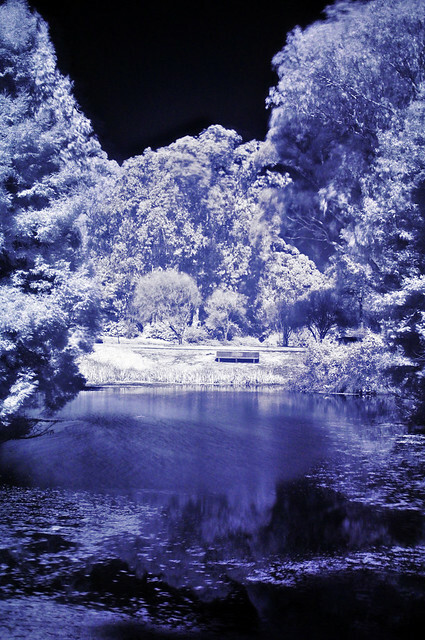 one of the small ponds in infrared. this was a long exposure. i love the way the wind left trails over the pond. i also love that the lilypads and growth on the pond surface glows light. sorry to hear about the heater :( start a bonfire? ugh it started to rain. i already threatened to call in sick if it snows in Sac. Beautiful picture but I AM SO OVER WINTER that I never want to see another drop of snow. EVER. We're supposed to get 2-4 inches tonight. We've probably got at least that already since it started snowing. This is lovely. I like the purple color better than the magenta. Is that a function of exposure time, or something you control in Photoshop? Ha! The Final Fantasy comment cracks me up, because it was making me think of the bizarre glowing forest in Advent Children. Anyhow, fantastic shot, and beautiful effects.